I've been thinking about making this dish since it started to warm up and the tomatoes began to appear on the vines. I could wait no longer and broke down, purchased a couple of Amish tomatoes and brought one of my own in with cucumbers and jalapeno peppers from the garden and got to work making this quick hot weather dish. For me, it is a main course and leaves me room for dessert. For Mat, it goes great with a sandwich and extra tortilla chips. In a food processor, mince the jalapeno, red onion and garlic. In a small bowl, pour the lime juice, minced jalapeno and garlic, and some coriander and cumin along with a few dashes of freshly ground black pepper. Let set for 10 minutes. In a medium sized bowl, after running the tomatoes quickly through the food processor, add the cucumber and then the other mixed ingredients. 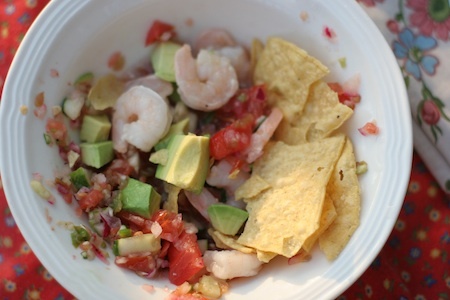 Save the shrimp and avocado. In each serving bowl, add the shrimp, avocado to the spice/veg mix.